A new chapter of the history of the tramcar in Blackpool began on Wednesday 4th April 2012. It is the first day in service of the Flexity 2 fleet of ‘supertrams’. Our cameras arrived in Blackpool on Good Friday 6th April to record some of the new trams in service from the late afternoon and into the evening at North Pier, North Promenade and Fleetwood. Next morning, Saturday 7th our filming starts at Pleasant Street tram stop where we board ‘011’ for the journey to Fleetwood. Our cameras film from various parts of the tram as we travel to the northern terminus at Fleetwood Ferry. At Fleetwood we witness the new trams running along the streets mingling with the buses and general traffic. At Fishermans Walk, Fleetwood we then board tram ‘009’ for the journey to Cleveleys, again filming as we travel to experience these smart new vehicles. With our filming complete at Cleveleys we board a very busy ‘004’ for the run down to Starr Gate, the southern terminus and location of the new state of the art depot built for the new Flexity 2 fleet. We film ‘over the driver’s shoulder’ and get a brilliant view of the track, passing trams and the familiar sites along the famous Blackpool promenade. At Starr Gate we view the exterior of the new depot and the arrivals and departures of more services. Its now time to board ‘008’ for the complete run back to Fleetwood. Again we film from the driver’s eye view, passing some of the old trams on the new Heritage Service launched the previous day. One such vehicle is ‘Fleetwood Box 40’ seen at Little Bispham. At Fleetwood we film more action before returning to North Pier on ‘005’. We conclude the day’s filming at North Pier and North Promenade where we see Balloon 713 on a late afternoon duty to Fleetwood from Starr Gate . To finish off the ‘First Weekend’ we film some evening shots at Fleetwood and Starr Gate on a very wet Easter Monday night. So it is ‘all change’ at Blackpool from the old traditional trams to the modern generation of low floor Flexity 2 trams. 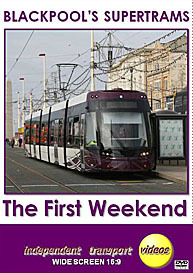 Come and see what they are like on this never to be repeated ‘First Weekend’ in service!